The Broom 530 is a further development of the 50os range, offering a variety of additional attractive features. The 530 has a large transom bathing platform which ideal for swimming, water sports and also for carrying a tender. Secure chocks can be fitted to the platform area and the tender can be lifted on and off by either a transom mounted crane or a special lifting passerrelle. The aft deck of the 530 comes with a choice of layouts. First there is the standard 50os enclosed cockpit (AC) or the full deck option (AD). This offers a larger open deck space with plenty of room for a table and chairs. Designed by John Bennett, the hull and superstructure are manufactured by Broom?s associate company Aquafibre. The mouldings are of excellent quality and are produced using hand laid chopped strand mat and woven rovings in Lloyds approved isopthalic gel coat and resin, over double brushed isophthalic gel coat all but eliminating the risk of osmosis. Substantial transverse and longitudinal stringers are incorporated throughout the hull for strength. The hull and deck joint is both riveted and bonded. There are two deck layouts available, the aft deck model and the aft cockpit model. The aft cockpit model has a deck that runs right around the aft of the boat, making working on deck safe and easy. The aft deck model has side coamings set right to the edge of hull. This creates a large area for open air seating and dining. Both models are available with a hardtop, where patio doors are incorporated into the design. Ergonomically well laid out, the console design permits ease of monitoring the engine systems and navigation equipment, together with an excellent view. Weather protection is provided by the large windscreen. A two part hood protects the helmstation and cockpit area, or in terms of the hardtop version, this protects the helmstation while the hood protects the cockpit area. A spacious forward heads is provided with sea toilet, moulded in washbasin and vanity unit with mixer tap. Shower compartment. 240 volt shaver point. Mirror. Towel rail, toilet paper holder plus toothbrush and glass holder. Complete with two single berths, bedside table, wardrobe and separate dressing room with storage cupboards. There is direct access to the heads compartment opposite to the mid cabin. At the heart of every serious cruising vessel is the galley. With the 50, Broom?s have surpassed their previous efforts to provide a huge working area which incorporates a fully electric system of hob, and microwave combination oven. There is of course, plenty of cupboard and storage space. A washer dryer comes as standard under the hob with a fridge freezer at the forward end of the galley. Dominating the centre of the craft is the deck saloon which has both a dining area and comfortable lounge seating. The raised dining area has excellent visibility yet is conventionally located near the galley. 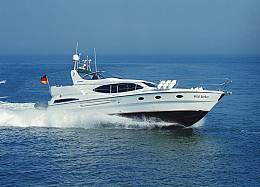 The powerful shaft driven diesel engines are located low down below the deck saloon. This enables the best possible stability and sea going qualities. There is very good access to the engine room for routine maintenance and for full service, the floor area can be removed easily. Complete with sea toilet, moulded wash basin and vanity unit with a cupboard and mirror. Mixer tap for hot and cold water supply. 240 volt shaving point. Towel rail and toilet paper holder, plus toothbrush and glass holder. At the design stage of the hull, the transom was given an immense amount of thought. The first aim was to provide a choice of methods to carry a tender, each one to allow for the variety of use and areas that the 50 can operate. This has been achieved by a choice of: 1) A hydraulic gangplank to link tender (as illustrated) 2) An electric crane located on the port side 3) A pair of conventional davits Having resolved the situation, attention was given to providing easy access by incorporating the built in steps and finally the location of the picture windows which double as escape hatches. Broom 530 Top Speed 30 Knots.